Do you wonder what exactly that means in the US? You’ve probably seen the decorations out for a while now, but is there more to it than just that? Do you see people dress up and do you want to possibly dress up too? If you are wondering what’s appropriate and what is normally acceptable, then you’re not alone. We’re going to talk about what Halloween means in the US and how people tend to decorate. 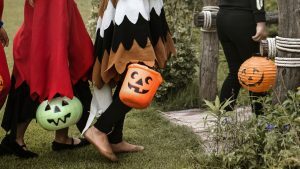 There is a very fun side to Halloween, particularly for the kids. There can also be a very scary element to Halloween as well. There are a lot of words, themes, and messages that relate to death around this holiday. This can be a fun holiday to celebrate, but the death theme is definitely present. You want to know how to talk about it, what is typically used in conversation, and also what traditions occur at this time of year. Understanding that there are a lot of words, phrases, and themes pertaining to death is a really important thing to understand. This is a time of year when these phrases will be used a lot. There are actually a lot of phrases used in English pertaining to death, even if they are indirect. These are phrases that you are bound to hear often, and so you want to know how to use them properly. dead (not alive, boring-can be used in many ways, completely): This can be used in a variety of different ways. It doesn’t necessarily mean it’s about death per se. It’s used in a variety of ways, none of which may mean death at all. look like death (look terrible): This often pertains to somebody who doesn’t look very good. It’s not very complimentary, but it can apply if they have had no sleep or if they are sick. They look bad because they aren’t at their best. dead tired (extremely tired): This is like being tired, but to an entirely new level. You can’t even put into words how tired you are, likely from sleep deprivation for some reason. wouldn’t be caught dead (would never do something): This is trying to accentuate the point that you wouldn’t do that in any circumstance. You do not want to get caught and you wouldn’t do it anyhow because it’s so not you. over my dead body (will never happen): This is to say that you will never let this happen. It’s a pretty firm statement and you are trying to get the attention of the person you are talking to because you have an important response. knock em dead! (do well, beat the competition): It’s another way of saying good luck. It may be a big competition and you want that person to know that they have your support, and you know that they will do their best. It’s a lot of phrases within one culture and language about death. You wouldn’t use them all at once, but they all exist and are used frequently. This is especially important to understand at this time of year when themes of death are discussed at length around Halloween. Everyone celebrates Halloween differently and has different traditions. Put Halloween into the search bar to learn more about what people do to celebrate.